This open cup bird nest (probably a Song Sparrow) has been parasitized by a cowbird. Notice the larger egg at the top of the photo. The female cowbird scouts out the nest, and then sneaks in and removes one of the host's eggs and then quickly lays a replacement egg, which the host then raises. 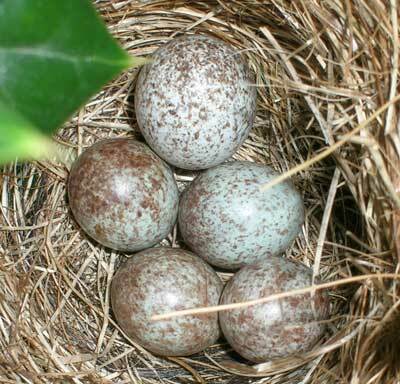 Cowbirds seem to prefer open cup nests, and the nests of other birds that also lay speckled eggs. Eggs do show up in nestboxes also, especially if the entrance hole has been enlarged.